In this section you will find DormCo's selection of Shelf Supreme Adjustable Shelving. Our Shelf Supreme dorm shelving units are durable and provide a lot of dorm room storage space while still being practical for your college dorm room. The frames of these dorm essentials minimize dust and allow venting for your dorm electronics, which is important. 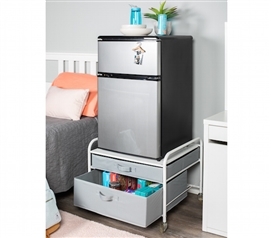 Plus with some of these options you can have your TV, dorm mini-fridge, and college microwave all on one dorm storage solution! With these neat dorm organizers you can save room on your dorm desk and dorm dresser for your other dorm necessities! The video game and DVD collection of college students rival the variety at your neighborhood video store. That means a lot of college stuff needs to be organized. A sturdy dorm TV stand with DVD and video game storage capability will keep all your dorm essentials neatly organized. These multi-function stands can keep your DVD player, gaming systems and more all hooked up to your TV for easy and clutter free storage. In addition, a cheap TV stand keeps those expensive games, gaming systems and DVD’s off the floor, which are only a bad step away from being ruined. Functionally smart dorm room furniture like our TV Stands and Game Holders are a wise investment that will last many years to come!